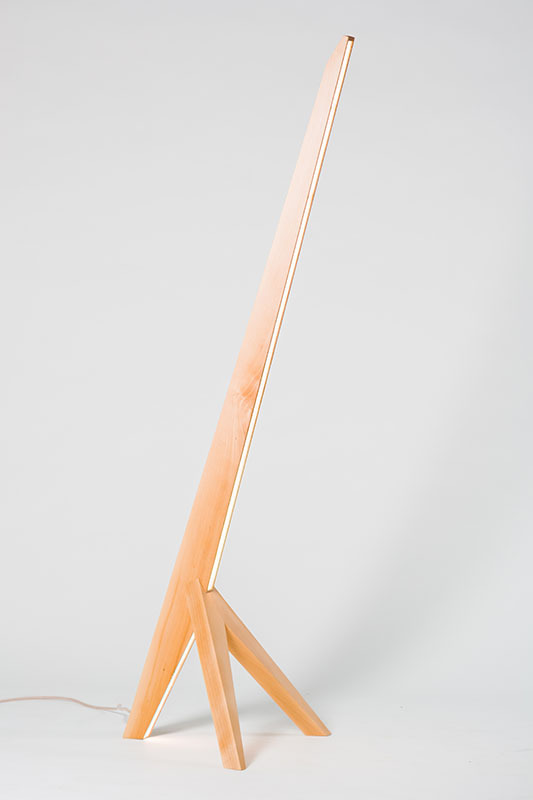 Showroom Finland PILKE Table Lamp Birch plywood 30 cm. x 28 cm. dia. Esthetic Lens contributor Christopher Poehlmann curated a show at the Messler Gallery in Rockport, Maine late last year. Following is the essay he wrote in support of this show. Wood and light in their most elemental combination is fire. Certainly, torches and camp fires are the base origins of light fixtures as we know them today. 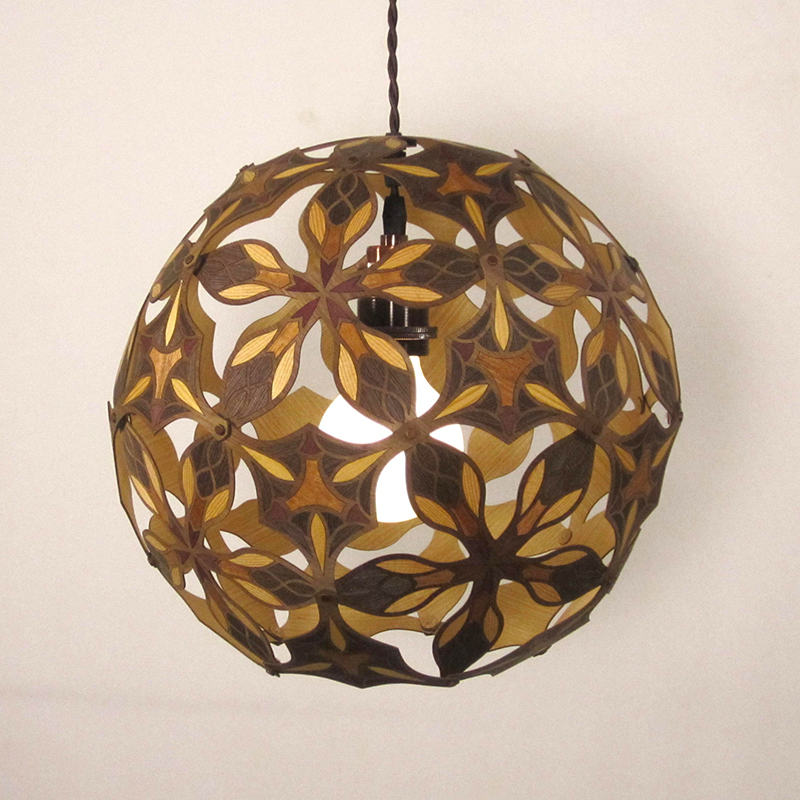 Wood however has seldom been the key material of choice for the design and manufacture of decorative lighting, historically being overshadowed by brass, steel, glass and even paper. Recent times, the past decade in particular, have seen an incredible upsurge in decorative lighting. 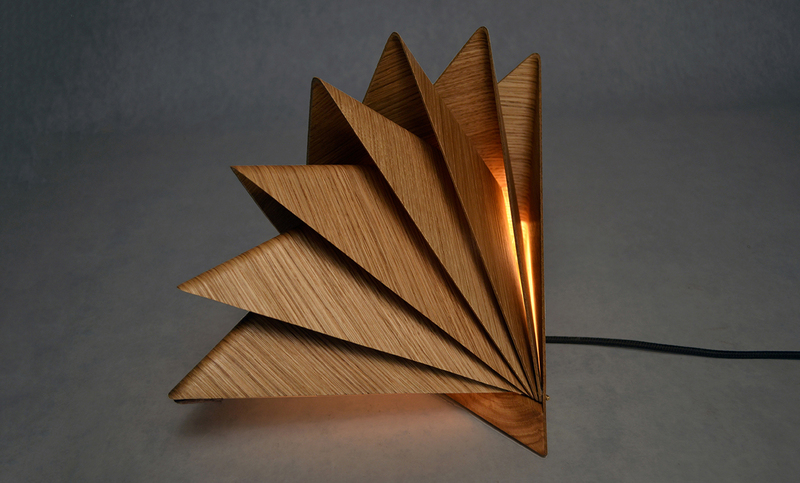 Small manufacturers with individualistic takes on lamp design have been cropping up worldwide, taking advantage of new technologies alongside traditional techniques using light and design as a medium of expression. 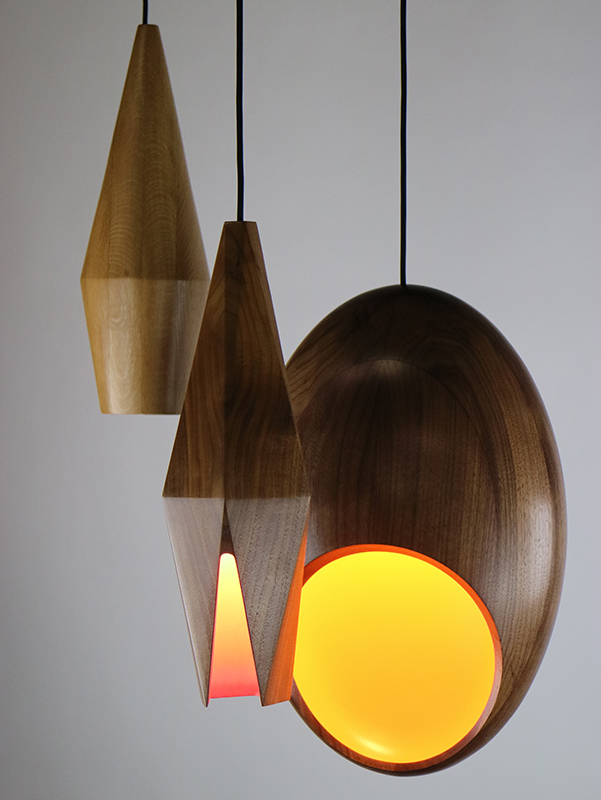 Wood’s recent popularity is due, in part, to an expanding market for well-designed and interesting decorative light fixtures as well as to increasingly refined maker’s woodcraft skills and techniques. The Messler Gallery exhibition Contemporary Wood Lighting features an international roster of makers specializing in turning, coopering, veneer work, CNC routing and laser cutting, and other fine woodcraft techniques speaking to the current state of Craft in its many incarnations. Given that the gallery is on the campus of the Center for Furniture Craftsmanship, attention to detail and craft were paramount in selection. However, concept and innovation also played key roles. Some of the fixtures are highly practical, others rather conceptual. The selected work comes from makers, designers, artists and manufacturers alike — a very 21st century mix indeed. Twenty-three makers of wooden objects exploring both woodcraft and illumination from seven countries are included in this unique, but by no means all-inclusive, survey. Craft can be a loaded term these days. I love Craft with a capitol C. It speaks of skill as well as concept – sometimes tipping the scale toward Art, sometimes strictly toward technique, and other times tipping it toward Design. Lately, I have become keenly aware of how much “craft” goes into CNC production. The makers in this show all fall at various points on this fine craft spectrum, each one illustrating the diversity of wood as a medium. Talk of Craft in the 21st century, I believe, should never be limited just to the hand of the maker but should also include digital design and fabrication. Technology has always had a role in Craft as tools and technological advancements over time simply extend the hand and mind of the maker. The CNC equipment employed in some of the work in this show allows the designers to include precision and repeatability that would otherwise be unobtainable. CNC technology – like computer driven routers and laser cutters — is refined and accessible enough that many small studio practices can now afford to have this equipment in-house. These tools in turn lead to greater control as well as allowing for more experimentation and innovation that is not often possible when solely relying on outsourcing. Computer modeling, especially in 3D but also in 2D, is also a component of Craft which requires great skill to achieve and do well. The makers in this exhibition were chosen for their unique visions and their mastery of the technique. They all create objects of quality and lasting beauty, objects which stand apart from their mass-produced counterparts due to the skill of these designers and artists. Thin veneer is possibly the most likely form of wood that one might expect to be utilized in the design of light fixtures. 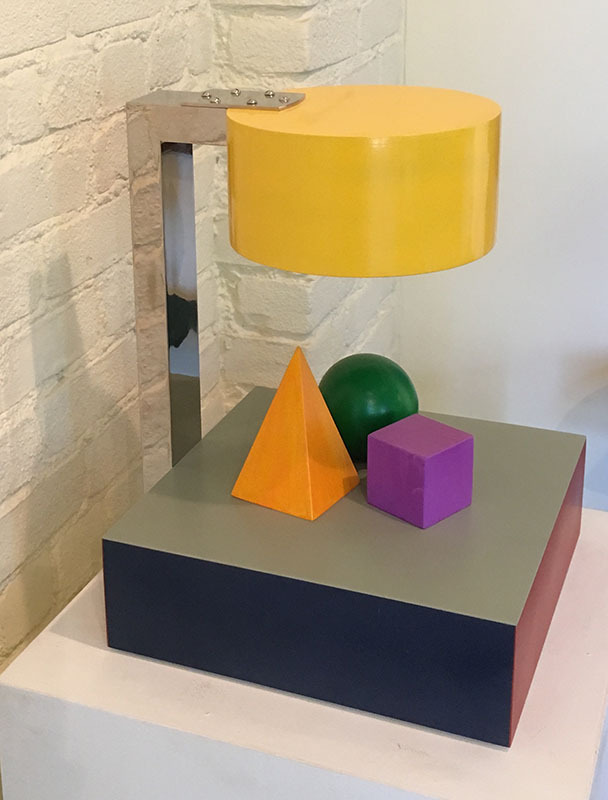 The Messler Gallery show features several makers who explore this medium in unique ways. Julie Morringello of Modern Maine and Marta Baumiller of Lampa both capitalize on the translucency of veneer in their work. 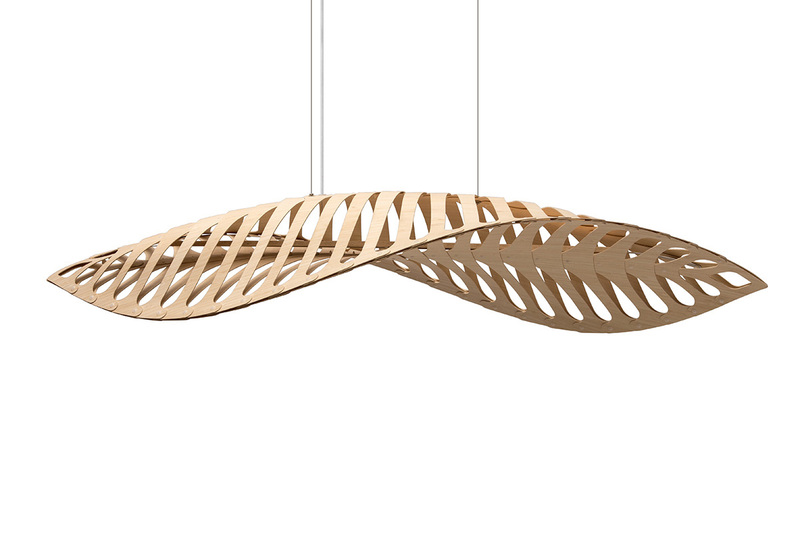 Baumiller’s pendant focuses on fluid undulating forms and woodgrain enhanced by rich color while Morringello explores a more technical geometry. 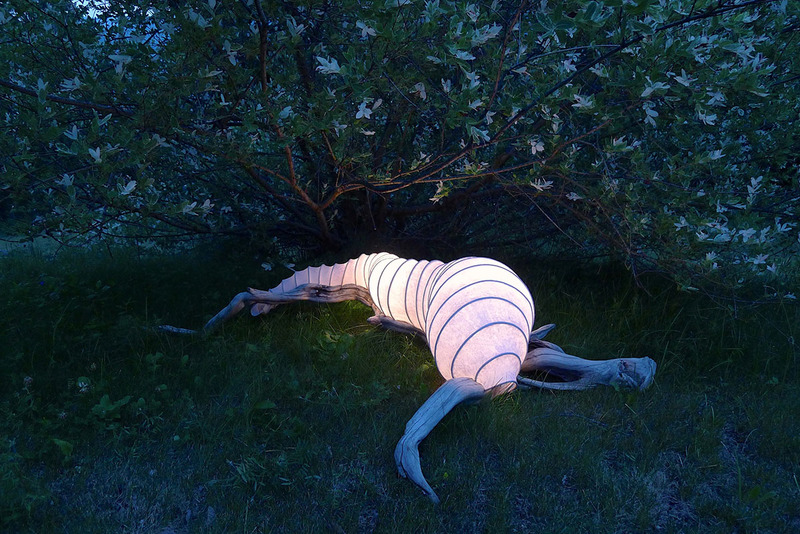 Artist Cameron Mathieson also takes translucency of material into account with his driftwood light sculptures. 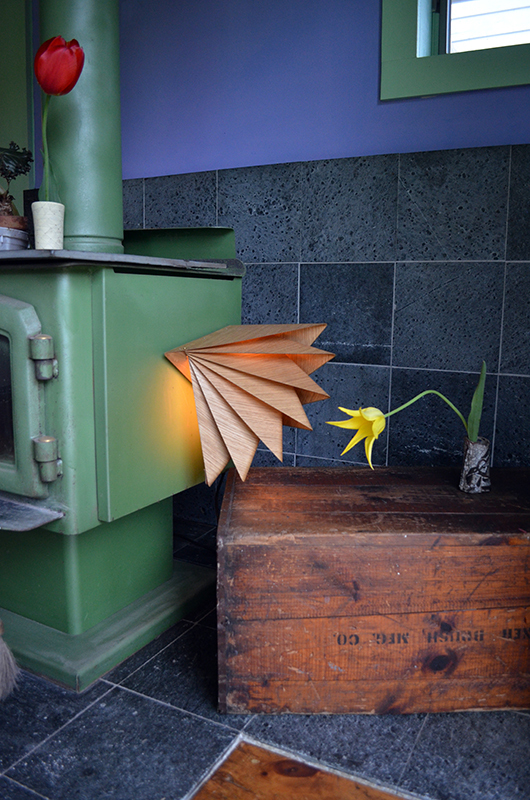 The handmade paper in his organic fixtures have a similar inner radiance to the aforementioned veneer pieces. A heavier gauge use of veneer (i.e. plywood) is seen in the work of Christy Oates and David Trubridge. 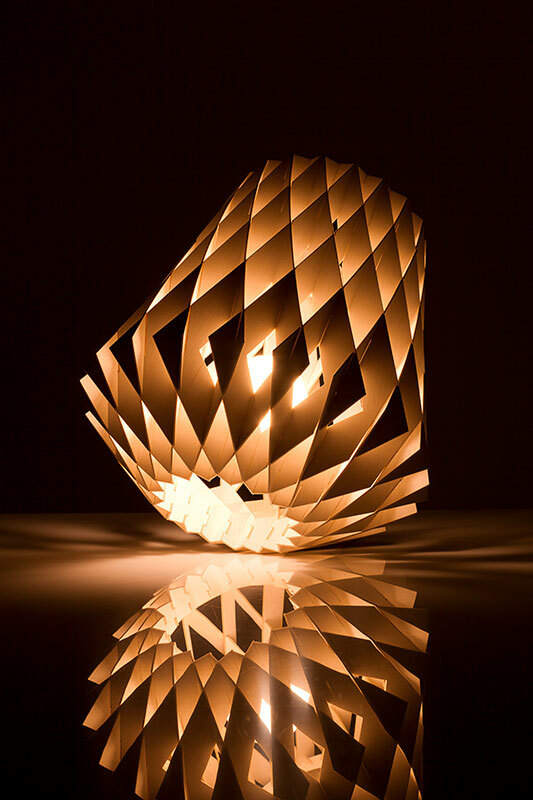 Both designers incorporate CNC machining in their work and feature mathematically proportioned repetition of parts that are flat-packable and then fastened together to form 3D lamps. This, however, is where their similarities end. Trubridge’s forms are derived from nature and realized by the machine, a wonderful dichotomy in my opinion. These fixtures are further enhanced by their marketability across a wide spectrum of tastes and styles. Adding laser cut marquetry to the geometries of her pendant lamps gives Oates’ pendant lamps a classicism that steps her work even further away from the organic geometries of Trubridge. Tuukka Halonen for Showroom Finland has designed the Pilke 28 table lamp which is CNC milled from identical parts that precisely fit together to form the lamp. 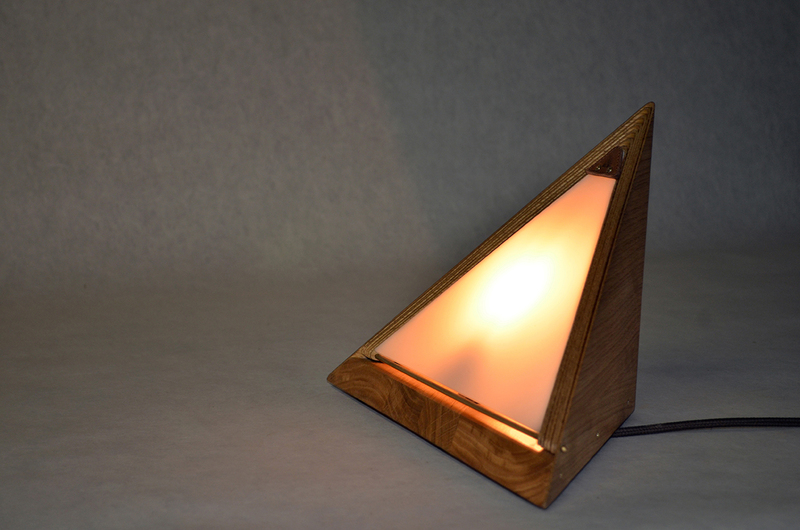 A jig could of course be used to construct this lamp, but the precision of the CNC machine allows for much greater accuracy, speed, and cost effectiveness which equates to a higher degree of craft at a more accessible price point than if this was entirely hand made. The CNC cutting of parts is almost secondary to the craft that goes into the computer drawings that program the machinery. The computer modeling skills necessary are as much of a mastered craft as wood turning or carving or jewelry making — simply another tool as an extension of the designer’s mind and hand. The Weave lamps by Graham Oliver for Obe + Co bring together two crafts: wood turning and basket weaving. The use of thin wood veneer gives these fixtures their beautiful warm glow while solid wood turnings top and bottom anchor them. 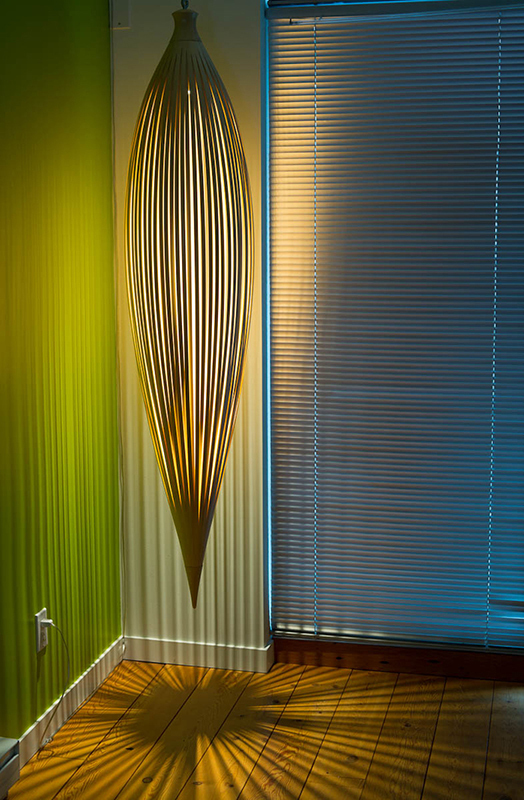 Like many of the other works in this show, the juxtaposition of contemporary forms with traditional techniques makes for designs that span the taste spectrum and work quite well in a vast array of interior styles. 30 cm. x 28 cm. dia. John Procario is a master of bent wood. His works manipulate solid wood into gestural forms that do not necessarily overtly reference nature as much as they simply give the feel of an organic form. Like brush strokes rendered in wood that in turn is split open to reveal a glowing interior, Procario’s work is quite functional but at the same time highly sculptural. 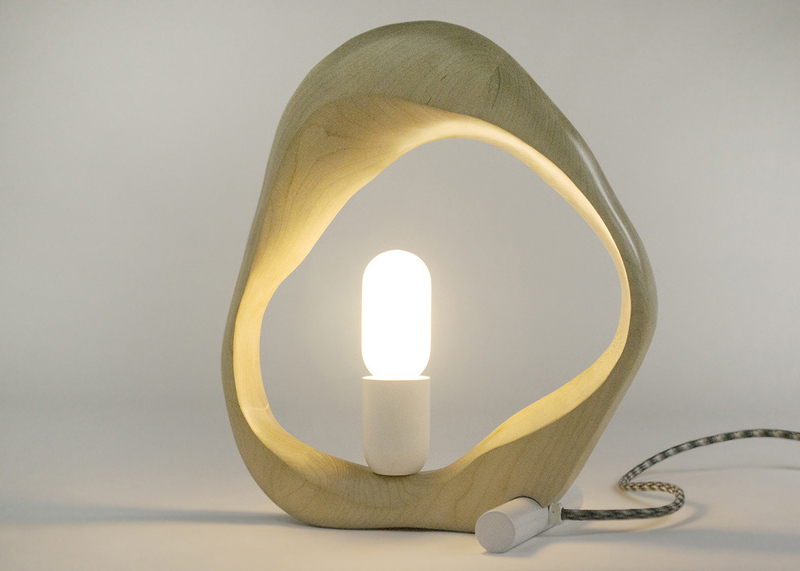 The idea of embedding a strip of light into solid wood is not unique to Procario however. 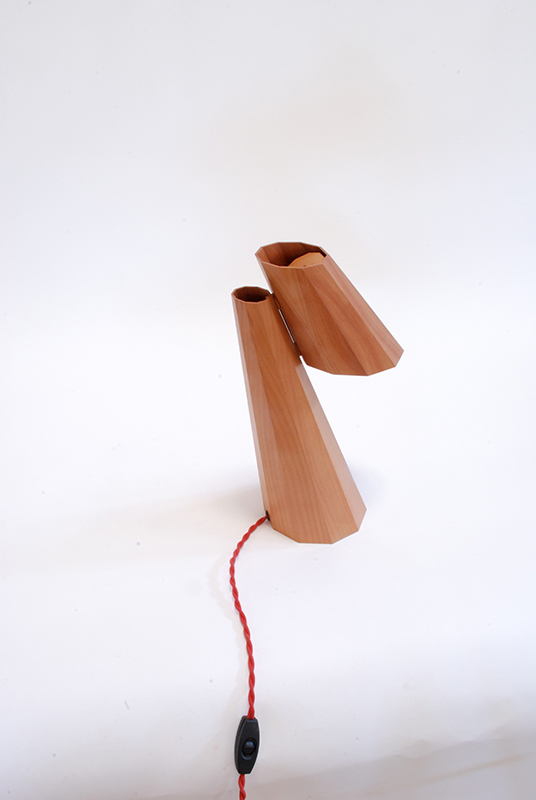 Max Kaplan shows his unique take on this idea with his almost anthropomorphic standing lamp. Both architectural and animal-like, Kaplan’s form explores subtle geometries and beautiful minimalist joinery techniques with an LED strip that illuminates the entire length of the fixture. Another master manipulator of wood included in this show is Peter Pierobon. A highly regarded studio furniture maker, Peter has ventured into lighting with his Plumb Light series which have the bold scale and presence of the furniture for which he is known. 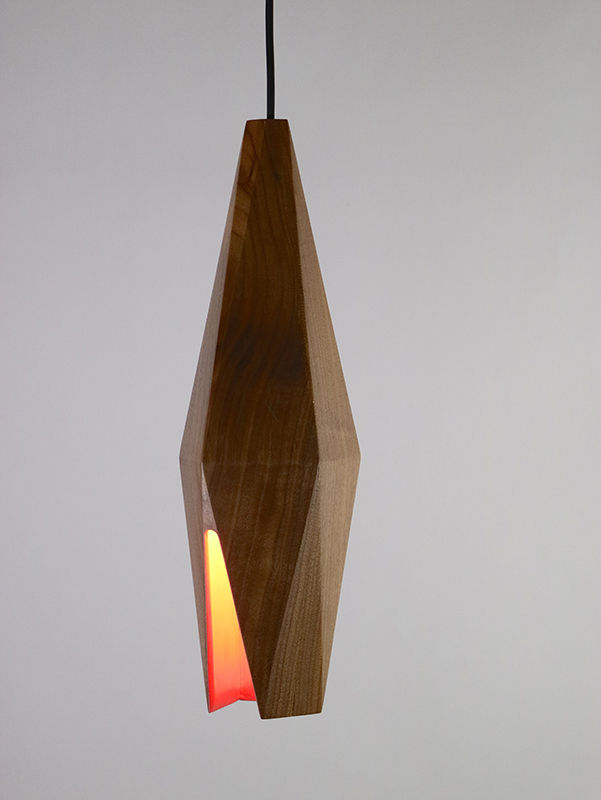 The Plumb Light, like several of the other fixtures in the show, uses light and shadow as pattern to create atmosphere as opposed to treating this fixture as a mere utilitarian object. Fine fabrication technique is key to the table lamp designs of Byron Conn, Klara Vavrosy, and Laura Mays. 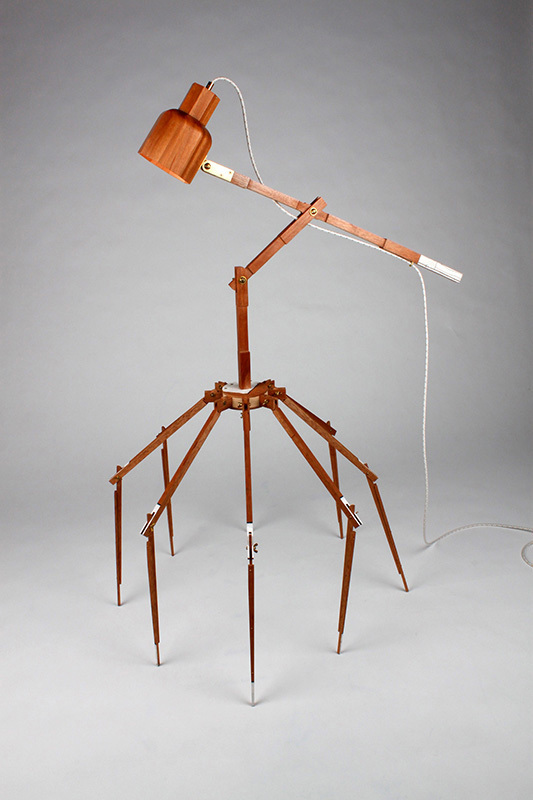 Conn with an almost anthropomorphic task lamp made from carved and bent wood, Vavrosy with a table lamp that folds in on itself, and Mays with a delicate table lamp made with coopered construction — the technique historically used for barrel making. In Mays’ hands, the exceptional design is as much about the idea of balance as it is about light or even the technical challenge of coopering thin wood. Both Conn and Mays create fixtures that are highly useful table top task lamps, but their fine craft sensibilities place them more on the heirloom object spectrum than with their mass produced utilitarian counterparts. Vavrosy’s fixture is more of a decorative object of ambient light with a design that is reflective of Czech Cubist work and Constructivism while taking the very contemporary stance of multifunctionality in that it can also be wall mounted as a sconce. Turning as well as CNC carving comes into play with a trio of pendants from UK maker Donald Baugh. His pendants showcase brightly painted interiors and natural walnut exteriors. The colors prove to be an essential counterpoint to both form and material, pushing the functionality of these pendants to an almost James Turell sense of space lost in pure color and light. Absolutely opaque, Baugh’s pendants are about the reveal of the interior and the beauty of their wood forms. At once solid yet ethereal, Peter Bloch’s translucent turned shades speak to the fact that a maker can refine his or her craft to the sublime and unexpected. Starting with a piece of Aspen weighing up to 200 pounds, Bloch works his magic on the lathe to remove almost all of the material, leaving only about a pound of wood measuring a mere 1/10” thick in the end. His shades are exemplary in technique as well as concept – basically creating a three-dimensional veneer. 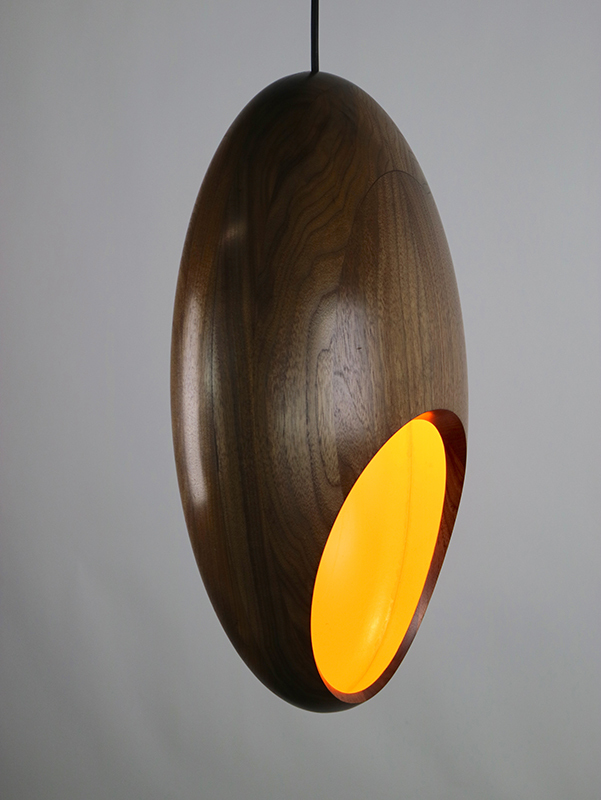 Renowned studio maker Garry Knox Bennet is represented with a table lamp featuring elemental forms in solid painted colors, the only fixture in the show that fully hides the wood grain — a typical move from this exceptional artist who has long been known to push at the edges of how we think about Craft. The makers hand can be detected in many of the pieces in this show. Most prominently though in the work of Susan Casey who deftly carves and polishes a large piece of maple for her table lamp. Key components include shadow and light playing off the random faceting are the key components. Katie Hudnall has a fine aptitude for showing the hand of the maker, but she also imbues her work with her quirky sensibilities – the mind of the maker. Technique is always present in an impressive way; however, it is concept that is key to Hudnall’s impressive body of work. Articulation and movement and play are all part of this artist’s tool kit. Hudnall’s Spider Lamp has all this and more, featuring eight articulated legs, a body that is inspired by the Anglepoise task lamps, and topped by a finely crafted shade that would make a Scandinavian Modernist proud. Hudnall’s whimsical sculptural approach brings us to the most conceptual of the pieces in the show: conceived and fabricated by Brent Budsberg and Shana McCaw. Their work often explores ideas of domesticity mixing concept, performance, and finely crafted objects. For their sculpture in the show, they take the idea of a broken and cast off antique street lamp and render it in tromp l’oeil carved wood. Complete with broken glass made from highly polished maple surrounded by a dyed and waxed wood structure representing cast iron, the object appears to glow from within as if it still emanates light even though severed from its original source of electricity. This work begs close inspection and introspection. 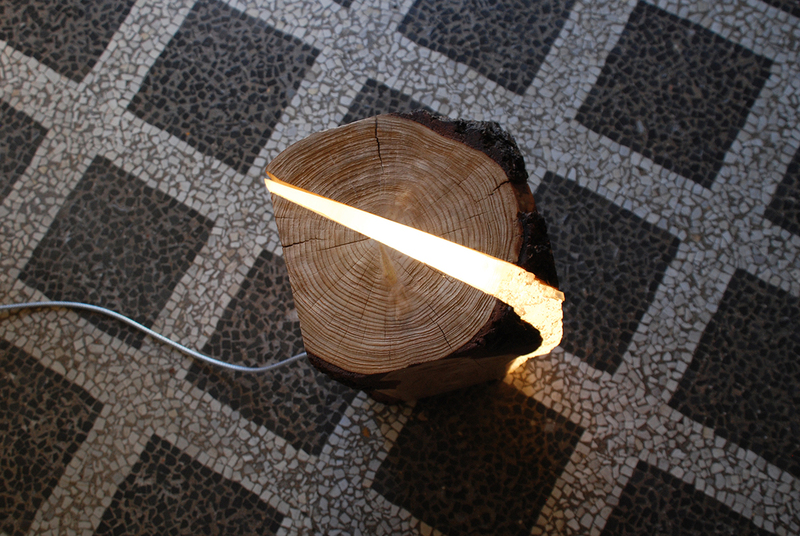 Finally, we have two artists creating whimsical lights from chunks of wood, related yet conceptually quite different works. 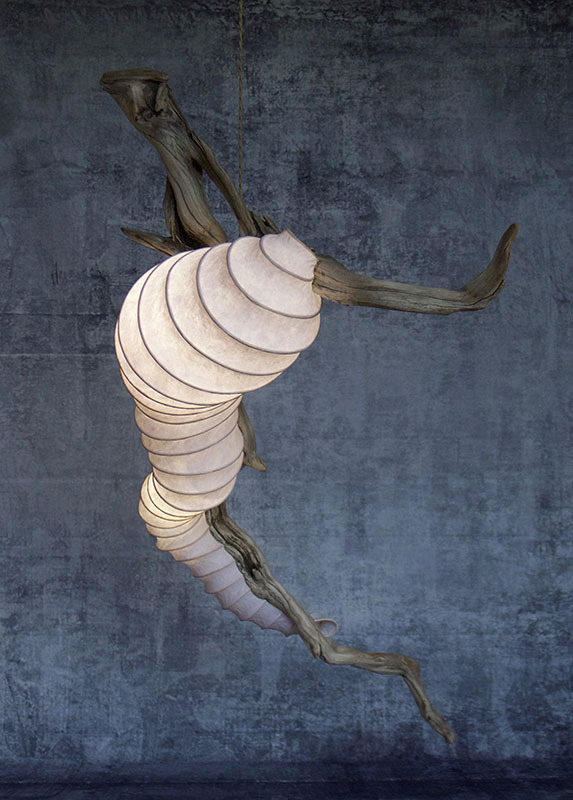 Duncan Meerding, a legally blind designer/maker from Australia, creates light fixtures from sections of tree trunks that emit light through cracks and spaces. His work is highly tactile, which is to be expected from someone who builds by feel. It is also a conceptually sound and engaging illustration of Meerding’s relation with light, reflecting his limited vision with which he is able to view the world. 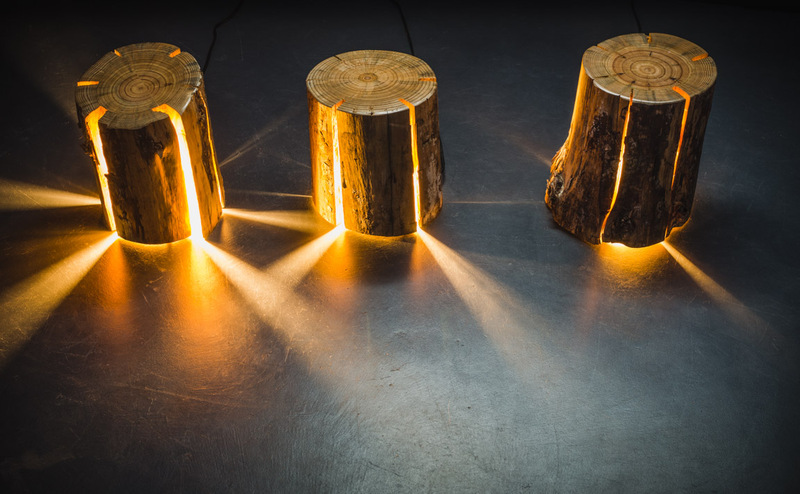 The Italian artist Marco Stefanelli too makes lamps from stumps, scrap wood, and split logs, but fills the voids with cast resin as an extension of the wood itself, albeit a glowing addition. 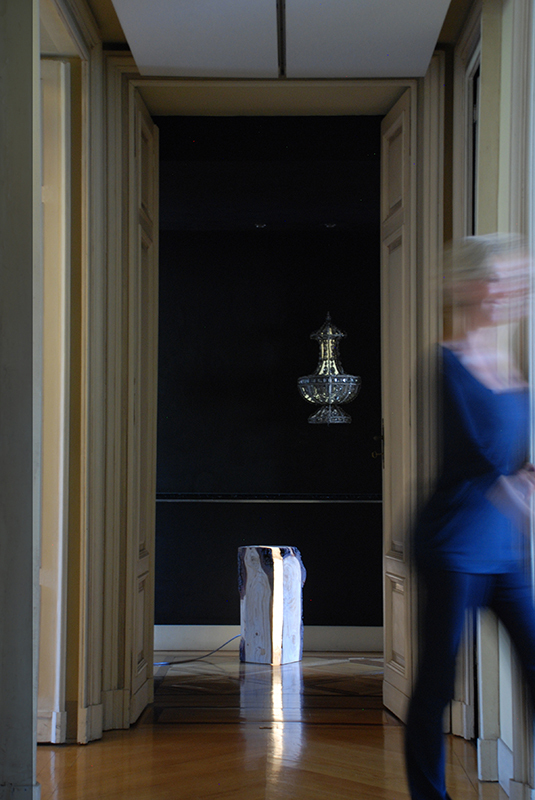 I see Stefanelli’s fixtures as being about the object where as Meerding’s are about the light, shadow and experience. In addition to illuminating surroundings, the work of both artists is primarily intended to amplify sensory experience. It is not lost on me that as curator of a show focused on wood that there is a certain irony in that I have been producing faux bois work for decades. 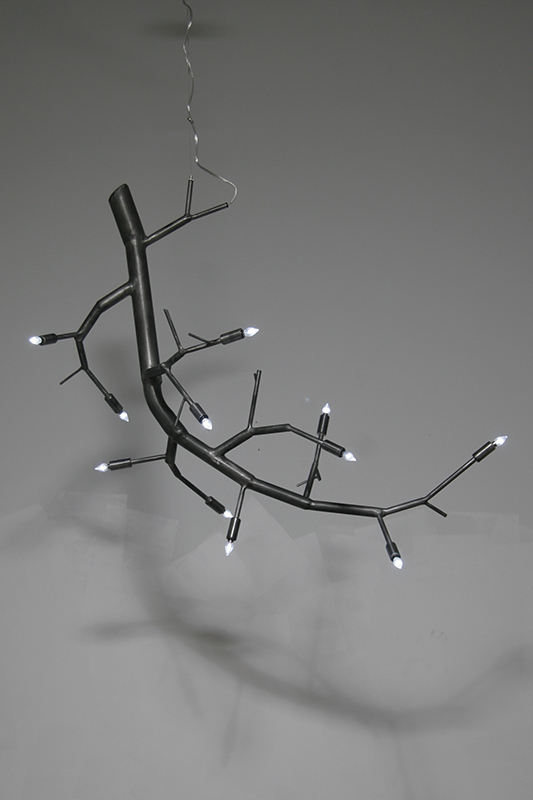 My newGROWTH fixture in the show is made from welded and carved aluminum. My visualization of a tree being genetically predisposed to grow into a very functional light fixture is my driving concept. Metal has long been my medium of expression. The piece is about wood, not of wood like the others in this exhibit. Over a dozen years of working through this series and nearly 30 years exhibiting functional objects at major international trade shows has exposed me to the work of the makers in this show and many more exceptional designs in wood that were not included, though I wish we could. As stated at the opening of this essay, wood is big right now. It is a material with both tactile and visual depth as well a cultural memory and familiarity. The 23 makers in this exhibition illustrate how wood can be manipulated to the will and whim of a designer and used to illuminate both figuratively and metaphorically. Wooden lighting, we see, can ultimately feed the soul. 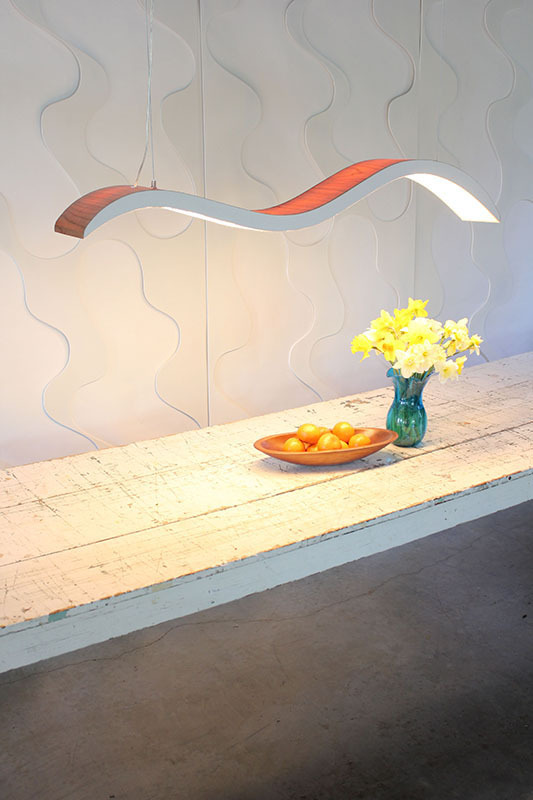 Christopher Poehlmann has been designing and building decorative light fixtures and studio furniture since 1990. His company CP Lighting has an international reputation and his work has been published in nearly every design publication across the globe. During his six year term as Trustee for The Furniture Society, Poehlmann developed and curated a number of gallery and museum exhibitions as well as an exhibition of emerging studio furniture design within the International Contemporary Furniture Fair that is now in its 15th year. Poehlmann also writes about design for publications like Modern.